The Green Clean Schools Leadership Institute will take place in Salt Lake City, Utah July 12-14. This event will convene our growing network of facility managers from schools and universities across the country to focus on how we can all move the green cleaning movement forward, in our own programs, communities and the field. The Green Clean Schools Forum at ISSA/INTERCLEAN will take place in Las Vegas Sept. 11-12. This event is the perfect way for school facility managers to get the most out of ISSA/INTERCLEAN, featuring a full day of interactive and engaging programming that dives deep into the Five Steps to Green Cleaning in Schools, a guided tour of the trade show floor and ample networking opportunities. Last year marked the first year in our five-year partnership with ISSA, which is focused on growing our network of engaged green cleaning leaders to push the needle on the way schools are cleaned. 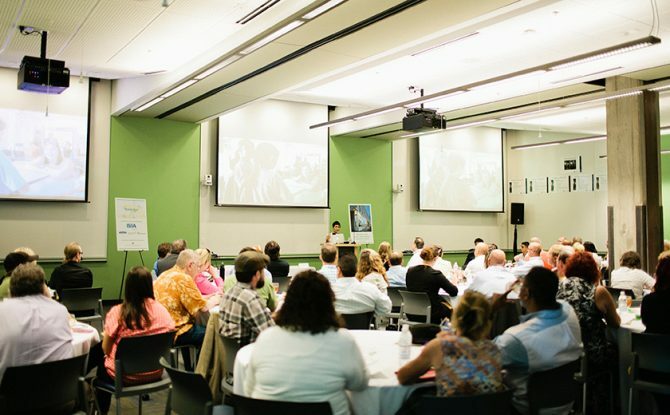 Close to 300 people came together at our 2016 events around a shared passion for green cleaning in schools to network, share ideas, learn from the experts and galvanize this movement. Building on that success, we are thrilled to be able to announce our programming for 2017 early enough for school facility managers to plan in advance for attendance, get the necessary approvals, and budget for travel. As in the past, we will also be offering paid scholarships for select schools (contact Halsey Ward to learn more). Stay tuned by signing up for our newsletter and checking the events page on greencleanschools.org. All details, including registration, schedule and lodging information, will be posted on our events page as soon as they are confirmed.